Will a change in design keep Sennheiser at the top of its game? Is an open-backed design taking things forward? An impressive set of headphones, but you might a cheaper kit that suits you better. How would you feel about an open relationship? Put your keys back in your pocket; Sennheiser's latest highend headset, the PC360, isn't a letter of introduction for the local swingers club. Instead it's an invitation to enjoy an open audio experience, in a world where everything is usually so closed. Confused? Then let us explain. Most expensive gaming headsets, such as the Corsair H1s, Logitech G35s, Creative's Sound Blaster or Sennheiser's own PC350s, are a 'closed back' design. That simply means that behind the speaker driver, the back of the ear cuff is a solid piece of plastic. 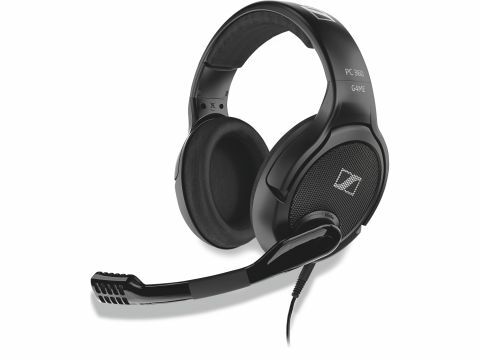 Closed back headsets are popular with gamers for several reasons. Firstly, they seal in those tinny-sounding audio leaks that drive people sitting nearby into spasms of pyscotic rage. They also block out external distractions, which is why they're a good choice for aircraft travel too. Professional sound engineers, however, tend to prefer the more precise soundstages of open backed earphones. Which brings us smoothly onto the Sennheiser PC360s, which have a carefully perforated pattern in the plastic of each earpiece. So, are you an open or closed kind of person?